If you’re the kind of person who gets up in the morning wondering what kind of mischief the American President got up to on Twitter while you were sleeping, first, seek help. Also, congrats, you got a fresh batch of Rage at Amazon Dot Com again, today. 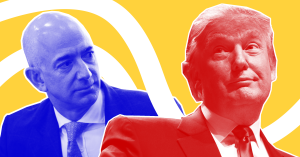 The (apparently one-sided) Trump-Bezos Feud has been going on for years, but continues to heat up as Donald Trump…continues to live in the White House. Refresher: Axios reported the most recent rumblings of Trump’s obsession with (and resentment of) the company. Several people privy to the matter noted that POTUS was interested in going after the company wielding anti-trust laws. The ire that some heads of state reserve for terrorists or enemies of the state is now being allotted by Trump to Bezos and his world-dominating corporate powerhouse. In classic Trump fashion, the facts aren’t exactly on his side. Amazon’s been paying taxes in California since 2012, and charged customers in all other states, according to the New York Times. And instead of taking advantage of the U.S. Postal Service, Amazon’s actually one of the few reasons the embattled agency is still around, the Wall Street Journal reports. That’s not to say Amazon doesn’t have its problems. Its warehouse employees are systematically stressed and overworked. And that goes without mentioning that whole worker-tracking wristband thing. Among other things. So far, the only fallout from Trump’s Tweets is Amazon’s stock taking a dip in the past few days. It’s anyone’s guess as to whether those drops will affect the company in the long term (or if this is all Trump wants to accomplish with his bluster). Not that it matters. Trump’s going to keep doing his thing, to whatever aim he has (or whatever has his attention-deficit-addled Eye of Sauron at any given moment). In other words: Just another Friday in 2018.